Lawrence Leung is among a new breed of Australian comedic storytellers; jesters with a plotline, if you like. His Choose Your Own Adventure TV series has its followers and detractors, but none can dispute Lawrence's warm delivery and earnestness. It's these qualities that apparently made Leung a great scam artist and card cheat. They're also the qualities that make Sucker an eye-opening and engaging part of The Carnival's Edge program. Sucker is not a new show; Leung won Best Solo Show with it at the 2001 Melbourne Fringe. But it suits the circus and magic atmosphere of The Carnival's Edge to a tee; and will no doubt be popular with Brisbane residents who haven't seen Leung live. 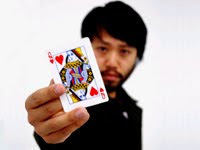 Sucker opens with Leung already onstage, his fancy card shuffling magnified via video camera to a projection screen. He gets the audience in the mood by suggesting a game of three-card monte; he slips and moves the Jokers and Queen like a pro. Leung then tells the audience how he spent three months as a 17-year-old travelling with an expert card shark and con artist; learning the trade and having the time of his life. The show features descriptions of a number of scams, and demonstrates poker-cheating techniques so deft that the audience is left in stunned silence. In fact, Leung sometimes has to prompt the audience for applause after tricks - as if their brains are too busy trying to work out exactly what happened and how those aces bounced out of the pack like possessed wallabies to remember to slap their hands together. Leung is at his best when telling his captivating story; some of his more traditional "gags" seemed to flop. His real mastery is blurring the line between what really happened during those three months and what he's invented; whether he was scammed or was the scammer. It's an entertaining hour, and like most encounters with con artists, you'll leave feeling just that little bit wiser. He's funny as a wading pool full of custard and midgets.